is published by Routledge and available now from various sellers in the UK and Europe and in various formats (Hardback & eBook). This work will initially be released first in hardback form priced £92 (normal for a small run academic book ) Unfortunately, there isn't yet a paperback version. Please note Andrew L. Cope have no control over pricing and release format. Paperback copies will be available at a later date and at a more affordable price. Status Quo were one of the most successful, influential and innovative bands of the 1970s. During the first half of the decade they wrote, recorded and performed a stream of inventive and highly complex rock compositions, developed 12 bar forms and techniques in new and fascinating ways, and affected important musical and cultural trends. But it’s a story of contradictions; despite global success, on stage and in the charts, they were detested and maligned by the UK music press who saw them as ‘lame-brained three-chord wonders’ and shunned by the superstar DJs of the era who refused to promote their music. As a result, Status Quo remain one of the most misunderstood and underrated bands in the history of popular music. 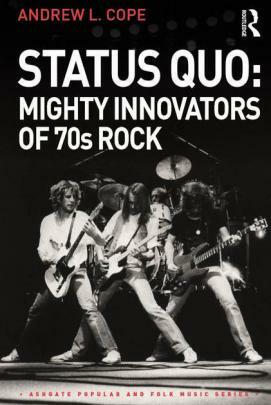 Status Quo: Mighty Innovators of 70s Rock attempts to redress that misconception through a detailed study of the band’s music and live performances, related musical and cultural sub-topics and interviews with key band members. The author combines easy style of writing with academic depth and rigour to champion Status Quo as a serious, artistic and creative phenomenon of the 1970s scene and help reassert their rightful position as vital contributors to the evolution of rock. The interviews I conducted with key members of the band Alan Lancaster (bass, vocals and composer) and John Coghlan (drums) were thrilling. They both helpfully and gladly provided fascinating detail to add a wonderful sense of authenticity to the book. A huge thank you to you both! Chapter 5 - entitled 'Praegressus Quo'. Latin for ‘the advance’, my chosen title seems a perfectly apt phrase to summarise the trajectory Status Quo found themselves on by mid 1973. They were moving forward with an unrelenting momentum like an army taking its objectives. They were prolific in composing, and indomitable as a collective unit, rock fans everywhere were tuning into the Quo hype that was sweeping the UK, and the band claimed hundreds of new converts every day. It was the release of Piledriver, which had entered the charts in January, that had catapulted the band to that new level of fame, but they were not interested in wallowing in their new found success—by late summer they were back in IBC studios recording their second LP for Vertigo, Hello!­ — their first album to reach Number 1. This chapter, then, examines key moments and compositions from the post Piledriver period 1973-1976. I have also received a number of fascinating e-mails from ​Steve Mielnik (who was Quo's German and West European booking agent from 1969 to 1972) and Thomas Franck in Germany relating to Quo's very first German shows & tours. I am a musicologist with a special interest in popular music, especially rock and metal. I have a very detailed knowledge of music theory, the history of classical music and the history of popular music. I am also a highly accomplished performer on both the electric guitar andclassical guitar. Combining those elements with a working knowledge of rock, pop and metal enables me to understand and contextualise rock, pop and metal forms in a special way. My musicology, therefore, is all about deconstructing the elements of rock and metal to further understand and appreciate the value of those musical entities. My experience as a highly successful teacher and music educator has enabled me to share my research findings in a clear, enlightening and interesting way. My PhD was undertaken at the University of Salford, UK under the guidance of Professor Sheila Whiteley. My research project was to (a) discover the musical elements that identify heavy metal, (b) position Black Sabbath as the originators of heavy metal, (c) understand the ways in which Birmingham UK influenced the emergence of heavy metal, (d) identify the salient features of rock through the music of Led Zeppelin (e) show that Black Sabbath/Heavy metal and Led Zeppelin/hard rock were dichotomous forms of popular music, (f) understand the role of women in rock and metal and (g) examine the influence of Black Sabbath on subsequent developments of heavy metal as it found form as genre in its own right. My thesis, 'And From the Dawn of the Sabbath Metal Was Born' became the basis of my book 'Black Sabbath and the Rise of Heavy Metal Music. I am currently researching the music and innovations of Status Quo 1970-76 for my next publication. In particular, I am tackling the common misconceptions of the band as a simple, three chord boogie band by demonstrating the huge variety of techniques, styling and innovation found in their early rock compositions.